The greatest challenge most marketers face is too much data. At any given time, we could be looking at hundreds, thousands, or even millions of data points, from retweets to bounce rates. No human can compute these, and even if we could, it wouldn’t be in a timely enough fashion to be usable. Learn about the 3 machine learning techniques that make our marketing data manageable. how will AI help marketers with retargeting and sales conversion? This is a really interesting question because one of the things that marketers struggle with is what causes a conversion? Or what factors? What measures what metrics learners what dimensions lead to conversion, or contribute to conversion. A big part of this is a foundation of attribution analysis. What things what pieces of data lead to have driven conversions on the past. And then obviously with things like retargeting. You’re trying to focus on what things are likely predicting what things are likely to cause conversions in the future and the way AI and machine learning help with this is dealing with what are called week learners. Taiwan page and bounce rate and stuff and you see all these cards over and over again. Now by themselves. Each one of these cards is a signal and these signals are real thin right now if we just start doing what’s called bagging, we start putting similar cards together similar cards together. we end up with a stronger signal do this enough and you end up with a very strong signal. 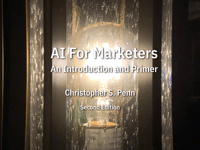 and that’s really where AI will be used to help marketers with with the retargeting the sales conversion, by identifying through techniques like gradient boosting through techniques like random forests and stuff. This combination of variables, whether it’s time or attributes of the person or number of times they’ve done something or percentage of things that they’ve done something this combination is the combination that will lead the outcome now if you want to kick it up a notch. many times there isn’t that one answer. There could be a bunch of things that perform well or in your company. different teams may have different KPIs, but they’re all important. So the events team has registrations as as a KPI, the direct response team has opens, right, the sales team has Mark has has deals closed. you may not get everything you want for your objective, you may have to compromise with other departments of the teams with other pools of resources. But the net effect the net computation will be that you’ll have the greatest overall benefit your company and that’s another that’s another part of machine learning. That’s super important. That is very difficult to do. Because the math behind it is crazy. It’s like huge, but if you’ve got it working, then you can understand better what you need to do, what combination things you need to do in order to get the outcome the overall outcome you want. Can’t do multi objective optimization if you have no objectives, so you have no clearly defined objectives. So that’s an important part is a prerequisite.